Located on Mexico's west coast in north-west Jalisco, around 10 km / 6 miles north of Puerto Vallarta, Gustavo Diaz Ordaz International Airport (PVR) is served by many major airlines and charter companies. Puerto Vallarta's is particularly close to the Pacific coastline and the area of Boca Tomates, while both Ixtapa and Las Juntas are also close by. Gustavo Diaz Ordaz Airport is the gateway into the fantastic international holiday destination of Puerto Vallarta and Mexico's popular Jalisco region. With almost three million annual passengers, the month of March tends to be the busiest time for the airport, with well over 300,000 arriving and departing passengers. Taxis and minivans are the main mode of transport from Gustavo Diaz Ordaz International Airport to Puerto Vallarta, taking passengers to the city and hotels. Both taxis and minivans leave from directly outside the airport terminal, linking resorts such as the Playa Los Muerto and El Nogalito, and destinations as far away as Garra de Cuero and San José del Valle. Overlooking the deep Bay of Banderas (Bahia de Banderas), the resort city of Puerto Vallarta was once a small fishing village and is now best known for its golden beaches, pristine waters and sublime weather. Year-round sunshine and sub-tropical temperatures make the Jalisco region of Mexico inviting whatever the season. Close to the resort itself, Gustavo Diaz Ordaz Airport (PVR) offers a gateway for thousands of holidaymakers, who fly into this part of Mexico each week to enjoy its water sports, and in particular the endless scuba diving opportunities. 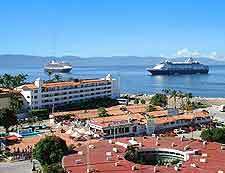 Puerto Vallarta itself consists of two towns - the old town of Puerto Vallarta and the new town of Nuevo Vallarta. While Nuevo Vallarta is bursting with hotels and nightlife, Puerto Vallarta is more sedate and situated to the south, at the foot of the jungle.